Pit Bull Type Dogs Featured in National Advertising? Yes, Please! Just the other day I was walking through a local Petco and discovered this advertisement. Don’t you love when pit bull type dogs are featured in advertisements like this one? It really shouldn’t be a surprise. According to Vet Street, the American Pit Bull Terrier is a top-three breed in 28 states across the country. These dogs are POPULAR to say the least, and people just LOVE them. Who wouldn’t, after all, with those goofy expressions and funny looking ears? Any savvy marketing department would want these StubbyDogs working on their side to bring in customers, don’t you think? Click here to see an adorable pit bull type puppy in a Scotch lint roller advertisement and check out Mowgli, the American Staffordshire Terrier, showing off his favorite toy on the In the Company of Dogs website. 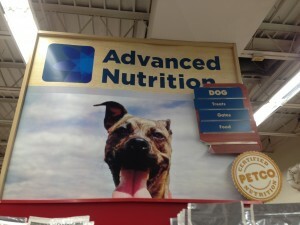 Where else have you seen pit bull type dogs in advertising? Tell us below! On the cover of the latest Jeffers Pet Supplies catalog! They regularly feature pitties on the cover. I work for Lands’ End and own two pittie mixes. We feature Pit Bull type dogs and many other shelter dogs that are currently available for adoption in our catalogs and internet advertising.